In Part I, I told you about how OutRegis! managed to get on the path to becoming a functional group this semester. That’s a pretty impressive accomplishment on it’s own, right? NOPE. We’re a big bunch of overachievers. We train ourselves that way. When half of your club activities consist of asking the audience for a one-syllable name so you can make up a five-minute musical number on the spot, “toning it down” and “starting small” have the same ring to them as “eating pencils” and “not crying during finals week”. No, we have this ticking urge to expand: improv to sketch, five to fifty minute scenes, and “Hailey’s hippie acting method stuff” to a full-blown dance group. I’ll pay the most attention to the first one, since it’s the most developed. As stated in several other places on this blog, OutRegis! started as a socially conscious sketch comedy group. It took a turn toward improv due to lack of writers and a fantastic president who knew her snuff when it came to improvised theatre. I truly believe this was a good move for the group; it allows more room for play, which allowed room for new members. Last semester, however, we started tracing back to our roots. 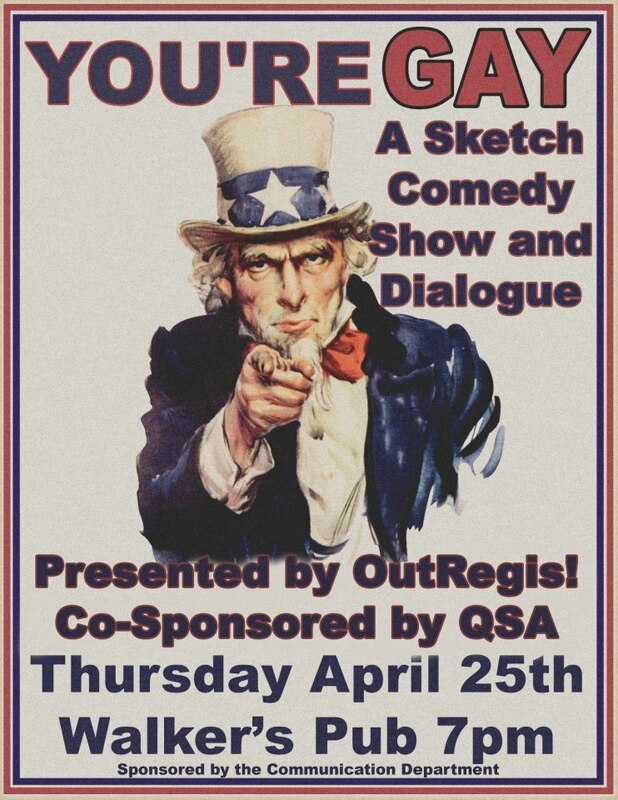 As I started an independent study in comedy writing with Dr. Reitmeyer, the then-president of Regis’ GSA came to OutRegis with a request that we use theatre to highlight queer issues on campus. Long story short, at the end of the semester, OutRegis! put on a sketch show that I had written based on conversations with the GSA and ideas festering in my own little head. We had a dialogue after, it was awesome, and OutRegis! more or less unanimously decided we should do this again and again and again. See, it’s not an insult if it’s American. Poster credit: Matt Burns, professional genius as usual. As I tried to get OutRegis! up and running at the beginning of the semester, I quickly realized that the whole sketch comedy thing was a stretch. I didn’t want to break the tight focus we’d developed during practice. (Like getting chickens to stay still on a hopscotch board, remember?) Furthermore, not all of the improvisers were interested in writing. Janna and I– true to our repeated pattern of “we could quit… or we could work even harder!”— decided the best option was to start a separate group just for sketch writing under the umbrella of OutRegis. Look, it’s experimental and disorganized, but it’s glorious. I thought I was funny, but many of my new co-writers knock me out of the park. We’ve even gained a couple of members who don’t want to do improv but do want to write. I’m excited to see what our sketch show becomes. Look for that in the spring. I’m not going to tell you much about our final development because 1) there are people far more qualified to do so, and 2) it’s still taking shape. Basically, improv is, arguably, spontaneous writing with added movement. OutRighteous formed an incubator that centers on the writing side of improv and sketch comedy. Well, a driven and talented freshman has expressed interest in creating an incubator for movement work, framed as an improvisational dance group. I didn’t know that was a thing until she told me about it, but I’m completely excited to see it. Keep an eye out for OutMoment posters, ladies and gentlemen. Is this expansion happening a little too fast? Can we handle it? How many puns can we make out of “OutSomething”? I dunno. I kind of feel like I got proposed to on a first date, went with it, got proposed to again, went with that too, and now I’m juggling two weddings and a box of pancake mix. Not to brag, but I went to metaphorical juggling school, plus we have the Master of Metaphorical Jugglers on our side: Dr. Janna Goodwin. We’re going to experiment and, from that, we’re going to thrive. Should students who are not inclined to think of themselves as comical, or theatrically-inclined, or particularly bold, consider coming to an OutRegis! workshop or rehearsal, or join OUtRighteous? Just wondering if you have to be funny, talented or brave.